With streaming video data rates, less is always more, unless of course, lower data rates mean visible artifacts. I just finished a review of the ZPEG Engine for x264, which produced bitrate savings of 21% without blocks, banding, mosquitoes, or other problems that would be noticeable by typical viewers. This was an average saving; the data rate reduction in some clip types, like movie clips, averaged 27.5%, with the data rate of some clips reduced by as much as 33%. 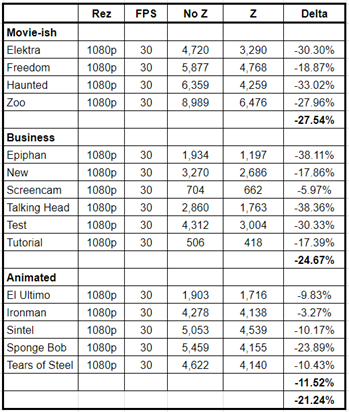 The table below shows content-specific, genre-specific, and overall savings over a general-purpose library of clips. The ZPEG Engine will be offered as a technology upgrade to the x.264 codec. These tests are summarized in a report you can download below. The report was commissioned and funded by CoreCodec, Inc. an x264, LLC partner. Though test procedures were discussed in advance, positive results were not guaranteed.